If you’ve learned anything about me these past months (holy smokes – I’ve been blogging nearly 24 of them! ), I am drawn to the odd, quirky, and kooky. I often do not like what others like. I did not like Titanic. I will not see Avatar. I don’t care how freaking fantastic the special effects are, the story just doesn’t interest me, and if I’m going to sit in a theater for 150 minutes, I better be interested. Don’t get me wrong, either. I love a blockbuster: Superman, Spiderman, X-Men, and all the Bourne movies are terrific. The latest Star Trek had this frugal gal and the hubster so jazzed that we forked over big bucks to see it on a gigantic screen. We were not disappointed, either! But, for the most part, these are the kind of stories that interest me – everyday life with a twist. They are usually a little bit funny, a little bit sad, and very interesting. You know that though. So I guess, I should say, here’s more of the same from me. A lonely German woman makes a new life for herself after leaving her husband on a trip to Las Vegas. With her tenacity, strong coffee, and kind ways, she befriends Brenda, the curmudgeonly woman who runs the cafe and motel where she is staying, all the while breathing new life to the place, magic, if you will, and into the lives of all around her. This is one of the first movies the hubster and I rented together. The theme song has always stayed with me. Joe Morton (from Terminator 2: Judgment Day – a James Cameron film I liked) plays an escaped slave from, you guessed it, another planet. Mute and possessing only three toes on each foot, he is otherwise human. He lands, quite appropriately, at Ellis Island, and ends up in Harlem where he befriends the regulars of a bar and is helped to get a job for fixing an arcade game with his magical healing powers. He need only touch an object or person and all is well. His real troubles begin when he is chased by two very cat-like bounty hunters in black (director Jon Sayles and David Strathairn). A great film about race, slavery, and the modern drug problem (through the lens of 1984). This may take the cake in the odd category. Despite being a brilliant Ivy League graduate, and much to her parents confusion and consternation, Jaye Tyler has chosen to live a rather aimless life in a trailer and work at Wonderfalls, a gift shop adjacent to Niagara. When a deformed wax lion suddenly speaks to her, her life takes a drastic turn. She listens, heeding the instructions, not only of the lion but to an ever increasing number of objects, flamingos, a ceramic cow, a brass monkey, taking her on wacky adventures that change lives, including her own. Domesticity is dull. 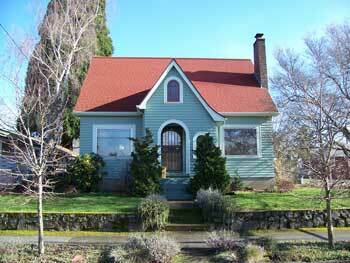 Inside the home, they say, is dead decorum and routine; outside is adventure and variety. The truth is that the home is the only place of liberty, the only spot on earth where a man (ahem, and a woman) can alter arrangements suddenly, make an experiment, or indulge in a whim. The home is not the one tame place in a world of adventure; it is the one wild place in a world of rules and tasks. Hello everyone! Gosh it seems like ages since I’ve posted, maybe to you, too. I’m sorry about that, but I really felt lousy with whatever it was that I had – mostly a sinus infection, but there was some serious fatigue in the mix, too. Yuck. If you look at the previous post, that’s about how I looked 90% of the time, too, wearing sweats and assorted hats to keep warm, spending copious amounts of time in front of the television, cats on my lap, going through boxes of tissue. A real party. A funny and slightly gross story to go with this. The hubster, who is quite used to me being full of verve at all hours of the day, became quite concerned after so many days of couch potato Colleen that he suggested I have my thyroid checked. Then, when he happened to be home for one of my uber disgusting nose blowing extravaganzas, he said, “Wow, you really are sick, after all.” I laughed and said, “That’s what I’ve been trying to tell you!” Bless his heart, he replied, “I’m a visual learner!” We had a good chuckle! This reminds me, have you seen the 30 Rock where Liz and Jack go to Stone Mountain, Georgia? Liz orders a special “chuckle” sandwich and gets very ill. Jack tries to console her by gently brushing a broom across her back while she vomits. I just about wet my pants with laughter watching that (perhaps this is saying too much about me, but hey, I didn’t actually write it and put it on TV, so there). It’s the gosh I’d like to be sympathetic, but you are grossing me out, so I’ll use this broom to keep my distance but give you a little TLC at the same time. Been there, but never thought of the broom, thanks 30 Rock! As you can tell, if you’ve bravely continued this far into the mire, I have absolutely nothing of substance to say. 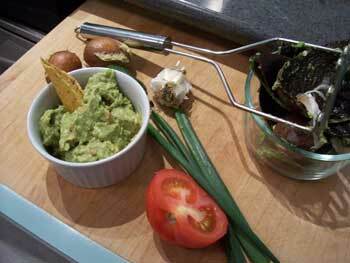 I guess I am not entirely well, but I did make that guacamole last night, and it was delish. Anyway, it is good to be mostly back. Hope you are well! Do we dare to be ourselves? That is the question that counts. 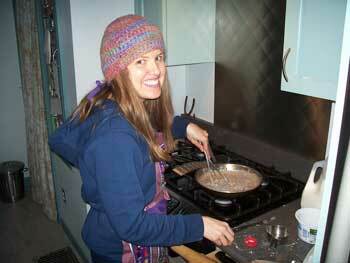 When I was living at home, my mom called this a Breakfast Wake-Up. 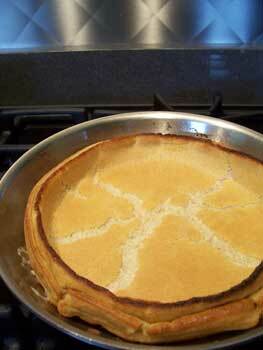 I have also seen it called an Oven Pancake. No matter what the name, the hubster and I find it rather delicious. It is a firmer variety of pancake – and very, very good. 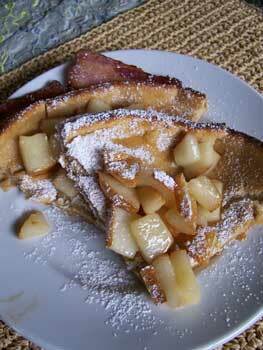 This one is topped with ginger pears using my recipe for sauces with regular-old pancakes that you can find here. I would say that the one down side to this recipe is that it only makes one pan at a time, so if you are really hungry, you’re also going to need to be really patient whilst making a second batch. I suppose there are worse things in the world. As well, yours may not look like the picture below when you take it out of the oven. Sometimes it comes out looking like a sombrero, others, a moonscape. It’s kind of neat, actually, like mad science! Preheat oven to 400 degrees with a 10″ skillet inside. Add butter to skillet, and remove from oven after it melts, about 2 minutes. Meanwhile, in a medium bowl, whisk eggs to combine. Add flour, milk, and salt; beat until smooth. Immediately pour batter into the hot skillet. Bake for 20-25 minutes, until puffed and browned. If you have an oven with a glass front – turn on the light and watch the magic! Be really careful not to touch the handle after removing from the oven. I can’t tell you how many times I have burned my hand because I forgot it was hot, ouch! Serve with butter, maple syrup, dusted with powdered sugar, or topped with your favorite sauce. Happy Birthday sweet Stella Ruby!